In a previous post about how you can save money on food in Toronto, I had mentioned this service called MealPal but couldn’t give a first-hand account of what using the service is like. Since the start of the new year, our house had been a little slower to get back to our regular routine of weekly meal plans + preps. MealPal finally lured me in with a 40% off code so I decided to give them a shot. Hot Tip: If you sign up for an account but don’t commit to a plan just yet, MealPal will try to woo you with email discount offers. I received emails starting with $20 off my first month, then $40 off, and then finally 40% off. Holy moly, Toronto is expensive. Who knew that and didn’t tell me before I moved here? I’m just kidding, I knew it was going to cost me some serious cash to live + work + breathe in this city. Maybe you are like me and have student loans + a deep fondness for oysters, or maybe you just want to save because that’s the reasonable and mature thing to do if you have the means. Toronto is expensive, but here are my tips for when you’re inevitably here and aren’t leaving and want to avoid overdraft fees. This is part 1 – eating in Toronto on a budget. Now that your closet is a little leaner (check out my post on cleaning out your closet if you haven’t read it yet!) let’s chat about food! I know that spring tends to be when everyone starts trying out new diets and cutting back. We may all have differing opinions on the necessity of a diet but I think we can all agree we can at least assess the things we’re eating to be a bit more mindful. My personal weakness is processed meats – salami is just too delicious for its own good. But I also like trying out new foods and eating cleaner at least helps balance my overall diet so I feel a bit less bad about the number of Oreos I can consume in one sitting. This is a pretty summery dish but screw it, there was a cucumber in our fridge that needed to be used before it started getting gross. Smashed cucumber salad is one of my favourite ways to eat cukes, other than chilled and slightly salted (for when I’m really lazy) after I do a workout. I follow basically this recipe that I found here. Fun fact about me – I love almost every kind of seafood. Even sea cucumbers and those things are pretty weird. Tuna and salmon are definitely two of my favourite fish to eat, especially raw because I love to live dangerously. Also because I much prefer that texture – baked salmon makes me want to cry. Okay not that drastic, but I don’t love it. Unfortunately, my seafood addiction is very expensive to sustain so I don’t indulge that often. Alright, that might be a lie. I have no self-control when it comes to feeding myself, which is exactly how I ended up buying myself a $25 tuna steak yesterday because I was craving tuna poke. I visited Jill in Toronto last weekend and there was a poke bar that we tried out. It was a decent place but kind of warm and didn’t have nearly as much tuna as I would’ve liked (but that’s not saying much as you’re going to find out later in this post – I spoil myself). Coming back to Waterloo I decided I really wanted tuna poke again so I set off to make my own. I love congee and I love seafood. My parents should not have fed me as much seafood as they did while I was growing up because now I’m super obsessed and it’s not cheap to satisfy seafood cravings, guys. Please don’t get me started on how much I love sashimi (ugh, momentary pause in writing to cry over how beautiful sashimi is and how mean my friend in Vancouver is for sending me picture of his sushi). But also congee! I love it, it’s just such a comforting rainy day meal. Not that that limits me to only eating it during rainy days, but I like to think of it as an Asian version of chicken noodle soup. I also just think that ever since I start university and had to learn how to cook my own meals, I’ve been craving Chinese food because it reminds of home and a better time when my mom did all my cooking for me. There aren’t many places in Waterloo that have congee and even the few places that do, don’t serve up bowls up to my standards (Mississauga and Toronto have spoiled me). Apparently Grace and Healthy Premium Dumplings does a pretty cheap bowl but sometimes you just want to make your own at home! In large batches! That you’ll eat all on your own and pretend that you’re normal! Okay enough about how weird I am, and onto the deliciousness of fish congee! 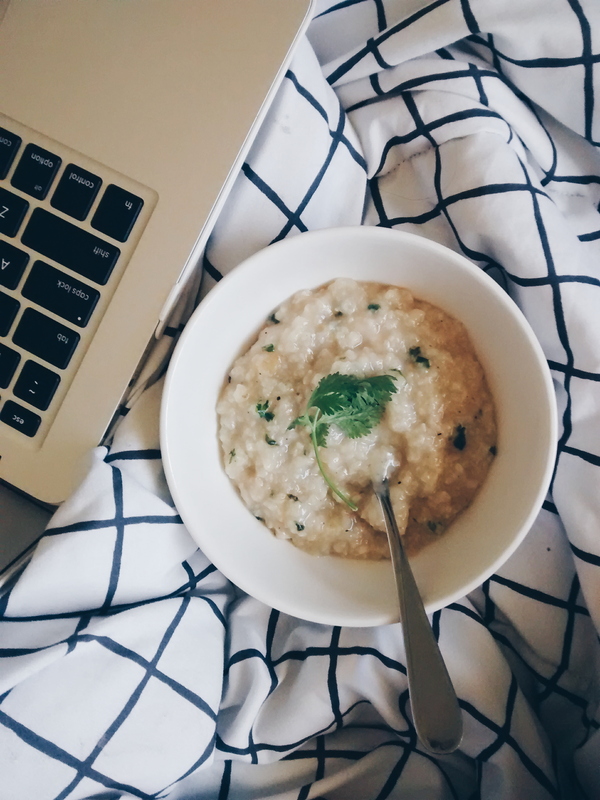 This recipe should make approximately enough for 4 bowls of congee. Sorry if that’s not that accurate. Soak the rice overnight if you can, it helps absorb the water so it can be broken down more. I like my congee this way but you don’t have to! Especially if you forgot to soak it overnight try to get it in water for an hour or so before you start cooking it. I’ve been told other methods of breaking the grains are to put it in the freezer, or if you’re lazy like me, stick it into a blender for 15 seconds. Put the rice and water into your pot to start to boil. All the starches are probably going to float to the top and look unappetizing. I’ve made this recipe a couple of times now, testing what happens if you skim off the layer of starch and if you don’t. Really, there’s no difference. 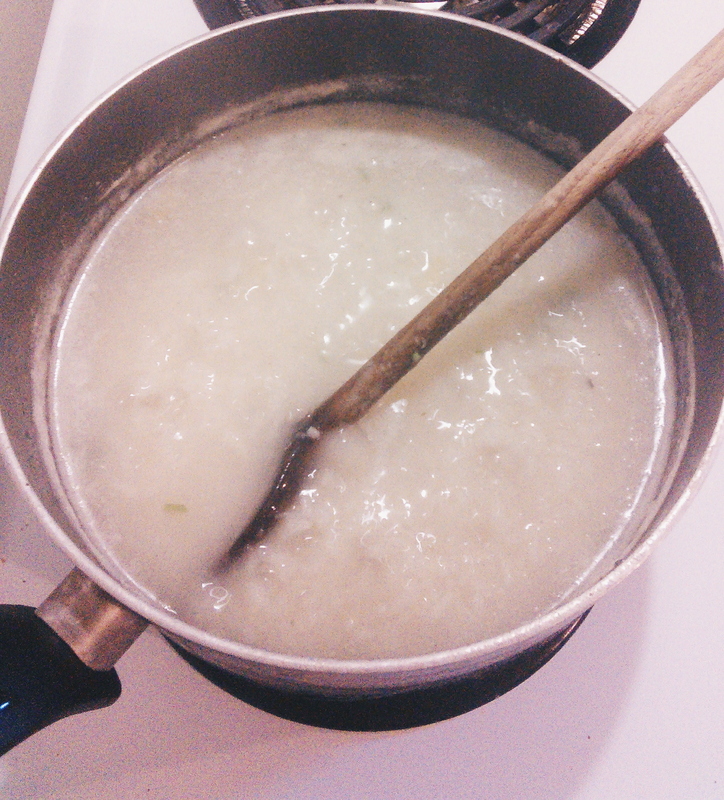 When the congee gets to be thicker it’ll all get absorbed in and it’ll be fine. 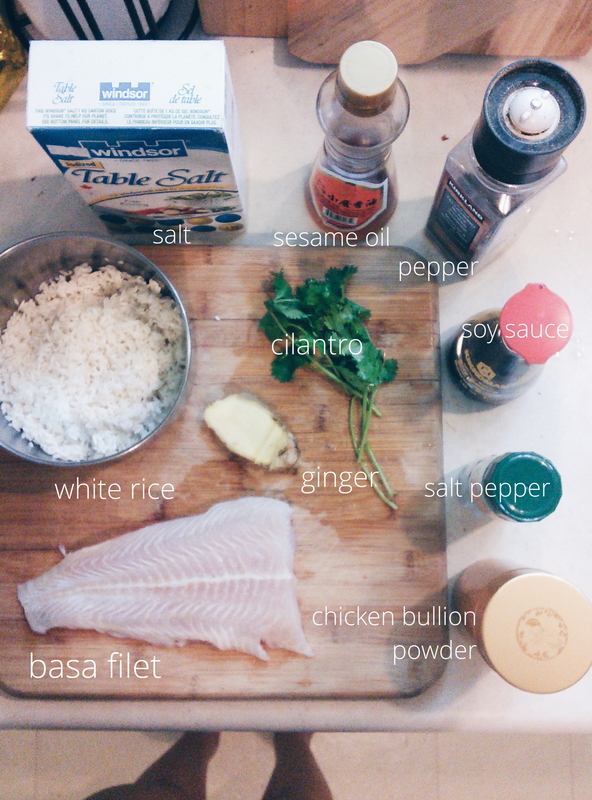 While your rice is boiled cut up your fish into really thin pieces so that it cooks easily. Marinate it in a bowl with the soy sauce, sesame oil, ginger pieces, salt, pepper, and the salt pepper. Add just a splash of fish sauce if you have it on hand. I like adding some cilantro at this stage because I’m a fiend for it. Leave the fish in the marinade until the rice is thickened and ready for it to be tossed in, should be around 20 minutes. Add in your fish when the rice in your pot looks thick and porridgey, as opposed to just rice in water. If you’re like me, you maybe freak out when your rice doesn’t immediately turn into congee-consistency for like, 15 minutes, and then it does and you thank god that there’s no one else in your kitchen to witness this. Rice looks like this when it’s about ready for the fish! Give it like, 7 minutes for the fish to cook through. It probably takes less time because it’s so thin but I’m not about to tempt fate. Ladle your yummy goodness into a bowl and top it off with more cilantro if you’re like me, or even green onion if you want! That’s all there is to fish congee, yay! Go use cooking as a procrastination method now!